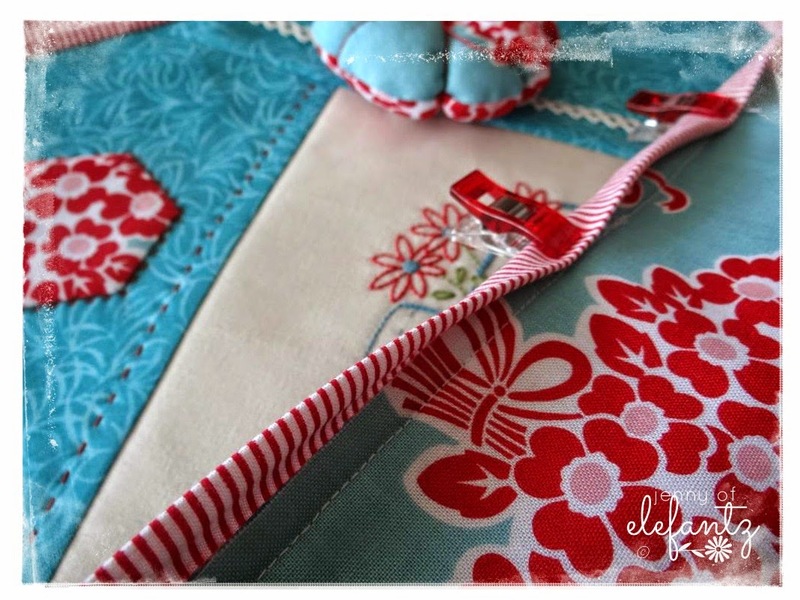 Jenny of ELEFANTZ: TUTORIAL - the sweetly simple sewing caddy! 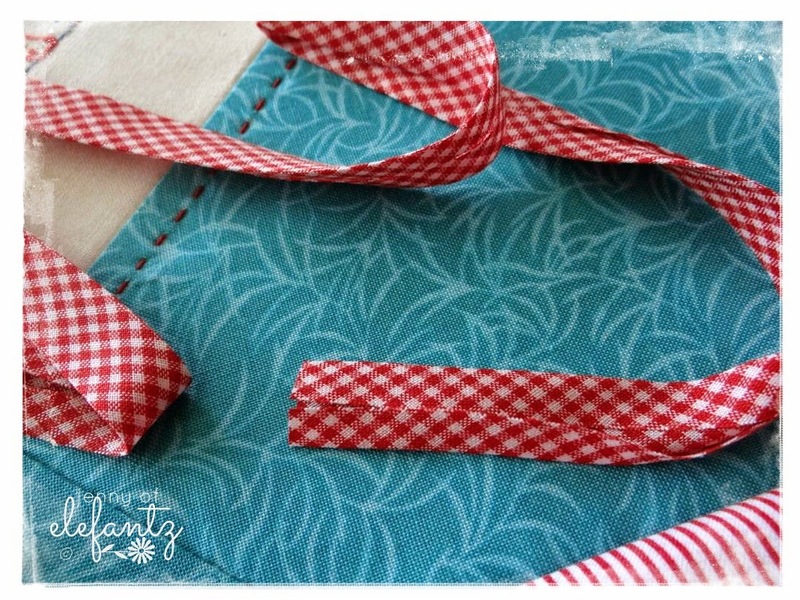 TUTORIAL - the sweetly simple sewing caddy! 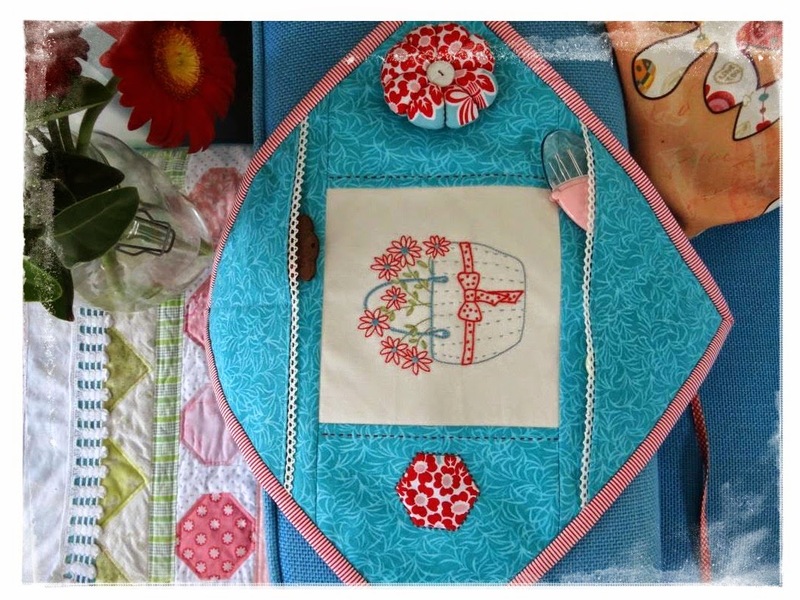 When I showed you my first version of this sewing caddy last week (here) there was a resounding YES to the suggestion that I share a tutorial for making one of your own. I spent a little time deliberating which of my orphan stitcheries to feature in the centre and finally decided on THIS one because I had a few fabrics that were perfect to compliment it! 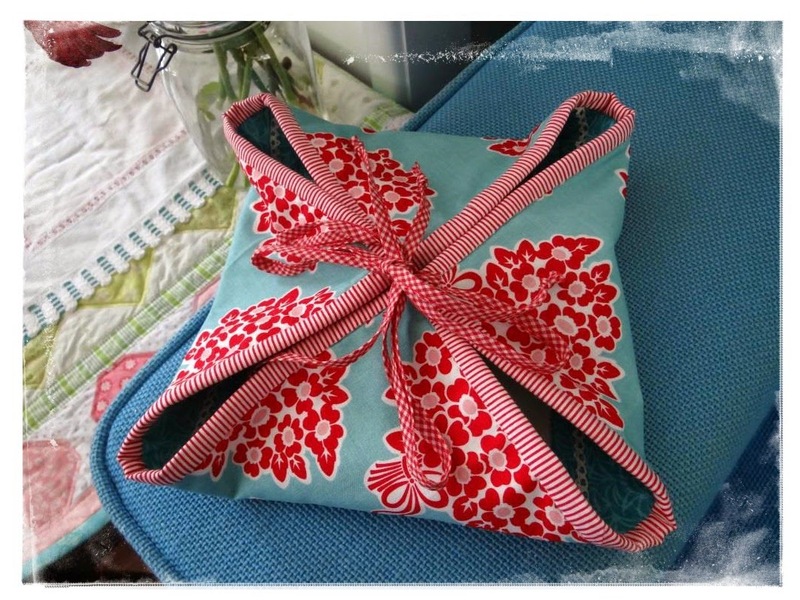 I've refined last week's vintage style caddy by adding ties to the corners so it can be closed when you're not using it, and the modern palette of turquoise and red adds some fun. 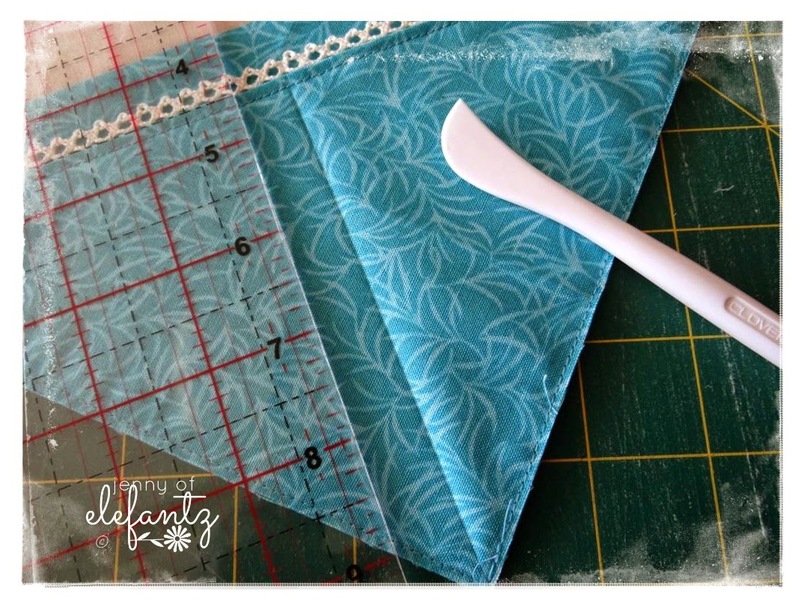 Carefully centering the point of a triangle with the middle edge of your stitchery, lay the triangle face down onto the right side of the stitchery block and sew across the long edge of the triangle with a 1/4 inch seam. Press the triangle away from the stitchery. 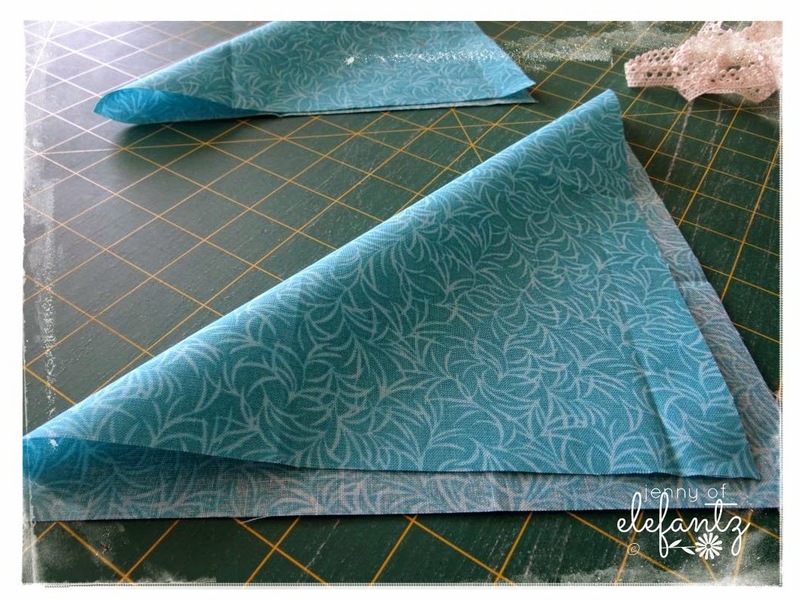 Sew another triangle to the opposite side of the stitchery. 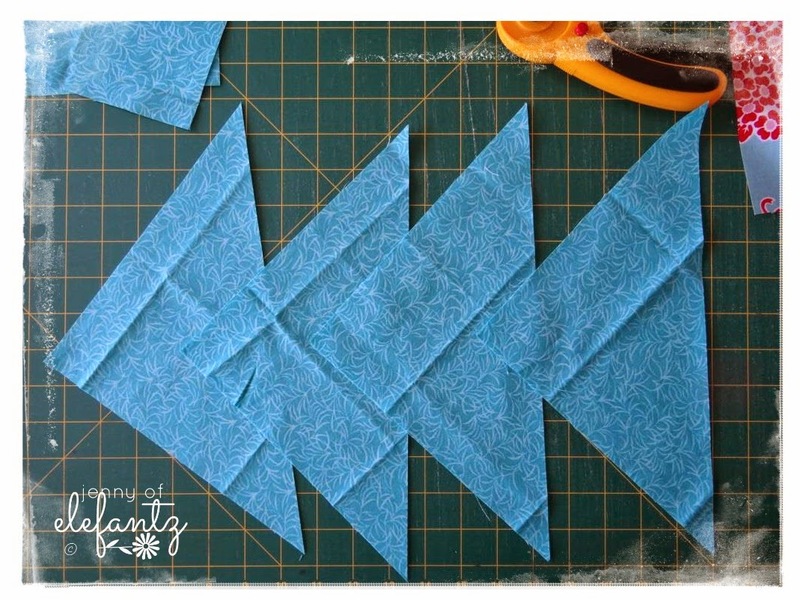 Sew your remaining two triangles to the other sides of the stitchery block. 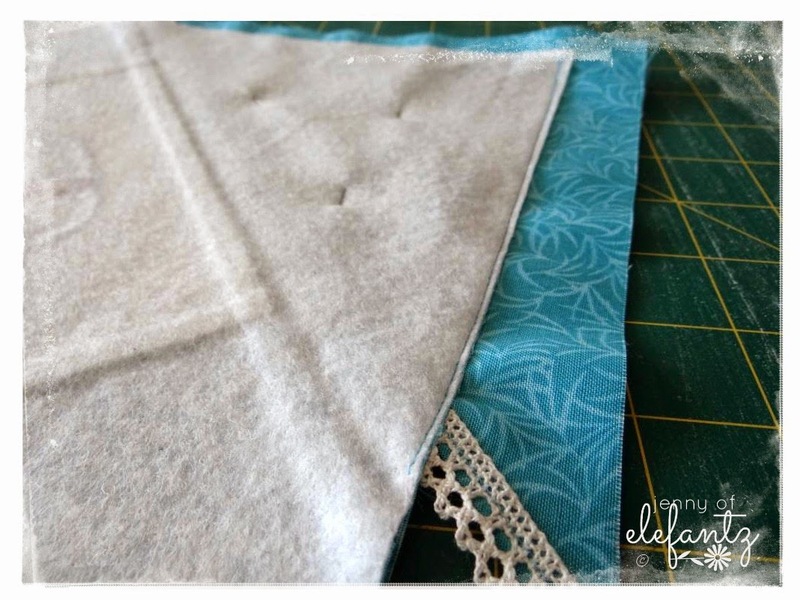 Turn the caddy right side up again and trim away the excess fabric from the pocket edges. 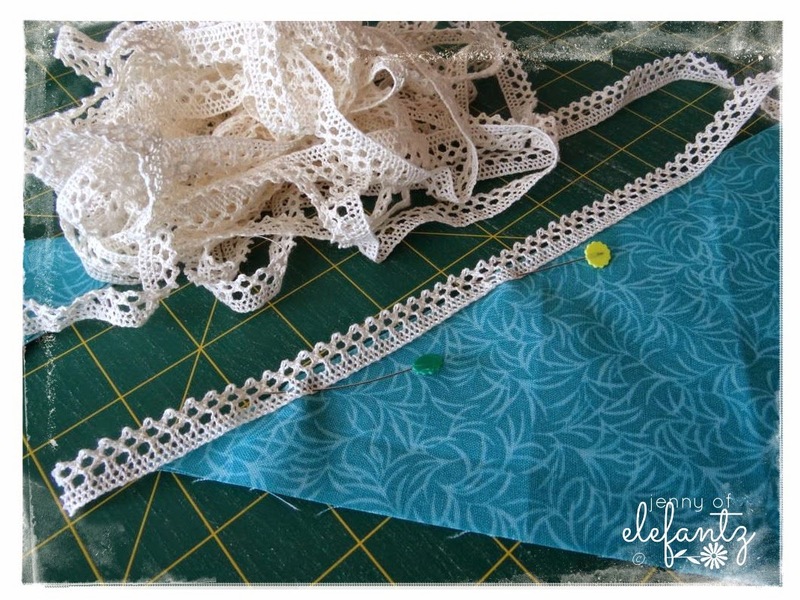 Sew along this line to create a double pocket. 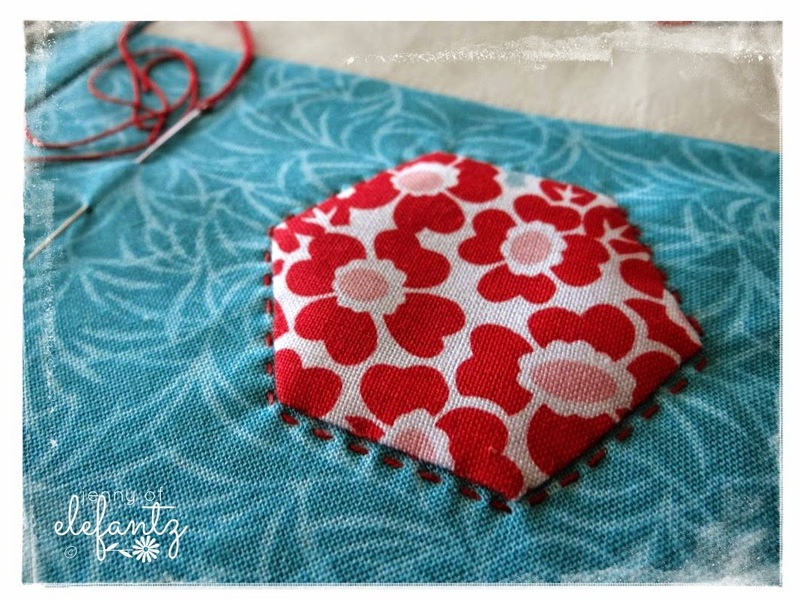 Make a 1" hexie shape with your 3 inch piece of floral fabric and the downloadable paper hexie template. 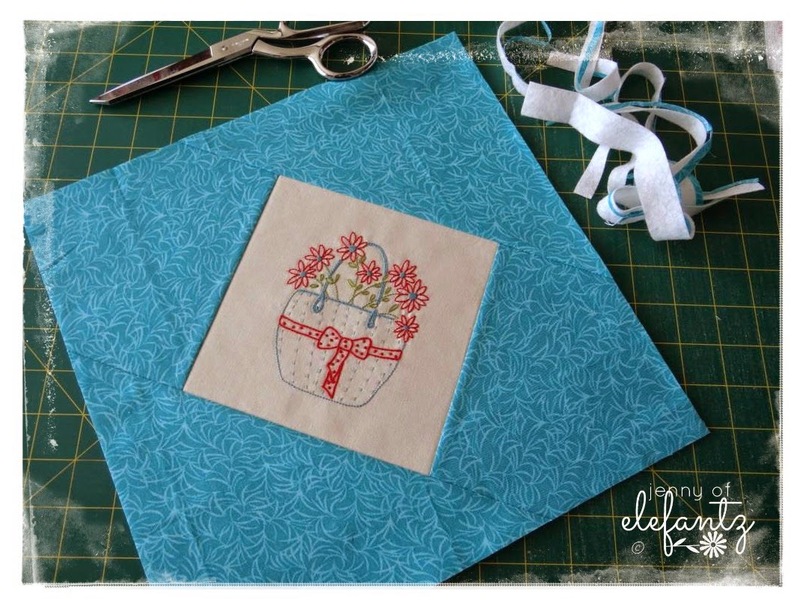 ...and sew a line of running stitch around it with some Red Perle #12 thread, or three strands of Red embroidery floss. 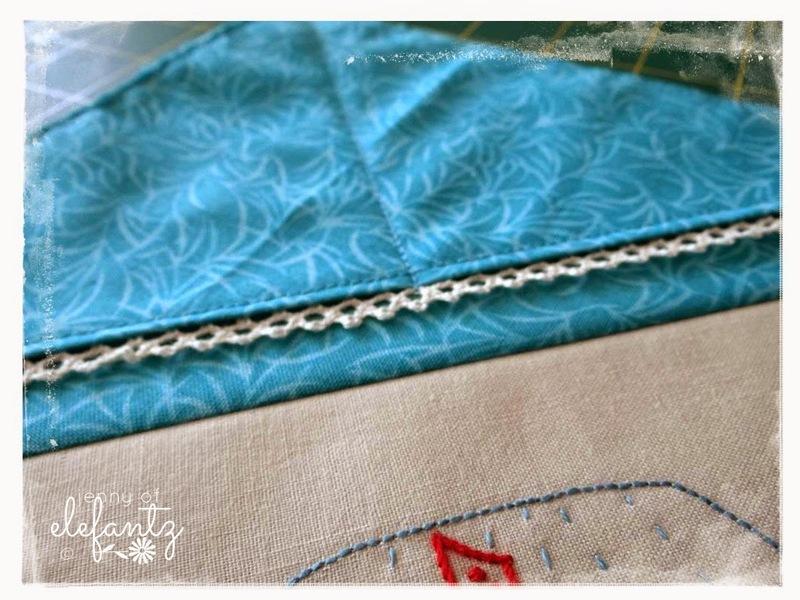 I also added some rows of running stitch along two sides of the stitchery block. 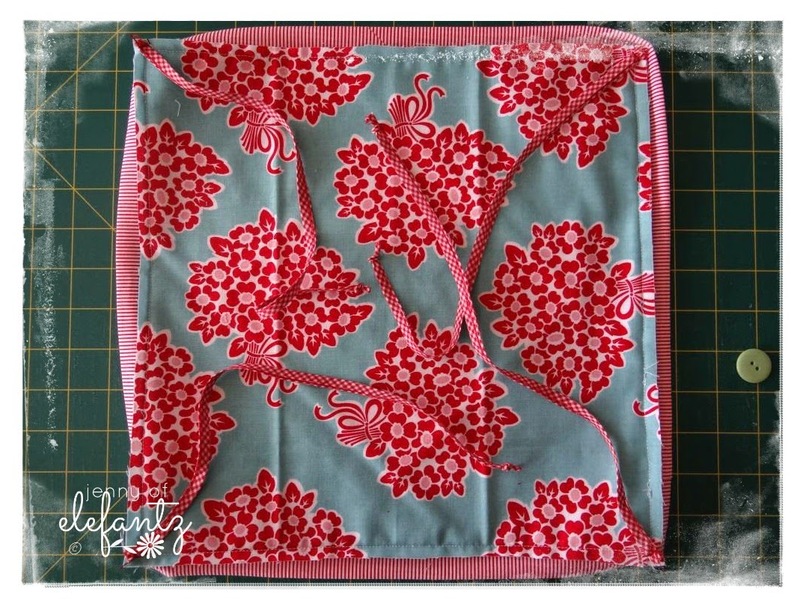 Lay the inside of your sewing caddy onto the wrong side of your 14 inch square of floral fabric and pin them together. Make a length of quilt binding with the 80 inches of red and white stripe fabric. 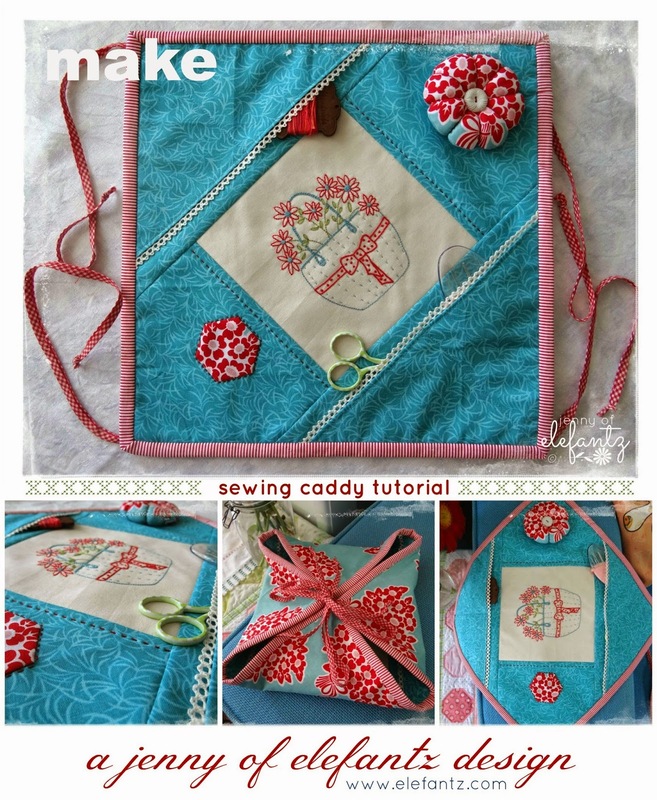 If you've not made or attached binding before I have a tutorial here. 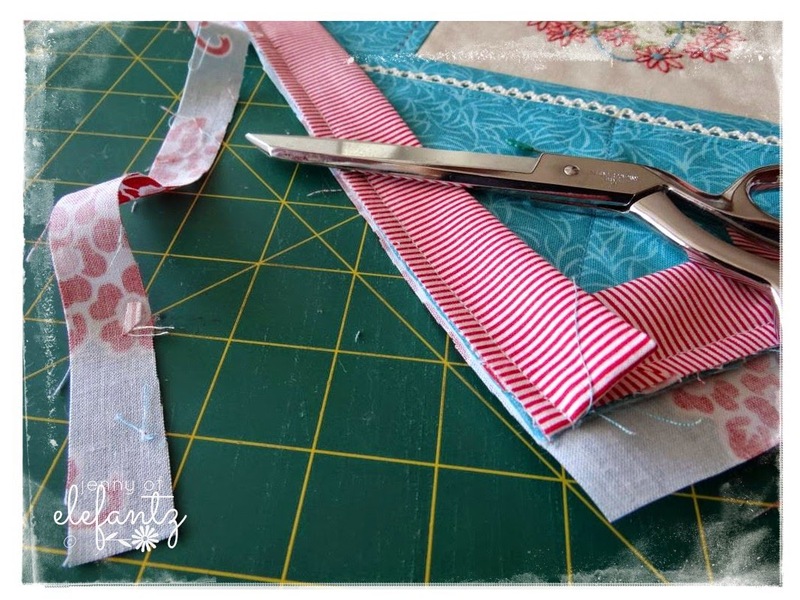 If you want to add ties to the caddy (my first version did not have them) you'll need 60 inches of ribbon, or fold some co-ordinating bias binding in half along it's length as I did, and sew it closed with your machine. Cut into four, 15 inch lengths. Make a knot in one end of each length. 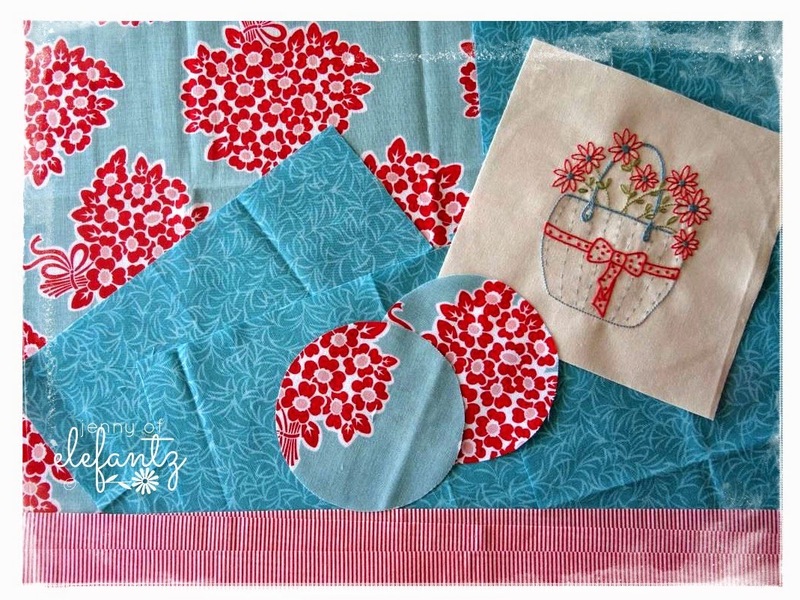 Now let's make the pincushion! Place two circles of fabric right sides together, and sew around the edge with a 1/4 inch seam, leaving a 2 inch opening. Turn the circles right side out, pressing out the edges with a rounded tool such as a very large blunted knitting needle or crochet hook. Fill with the polyester toy stuffing. 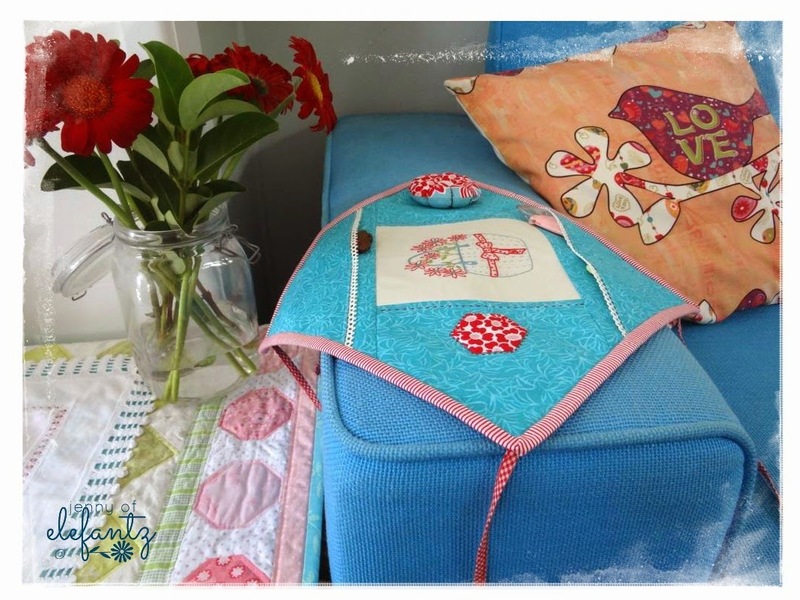 Ladder stitch or slip stitch the opening closed. Thread your needle with a length of Red Perle #12 cotton thread. Make a good size knot at one end. 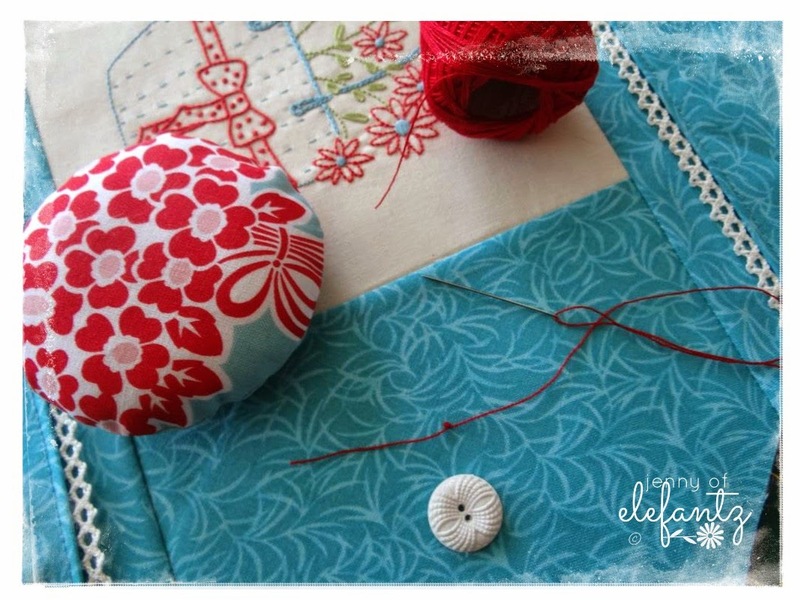 Place the needle down through the centre of the pincushion. 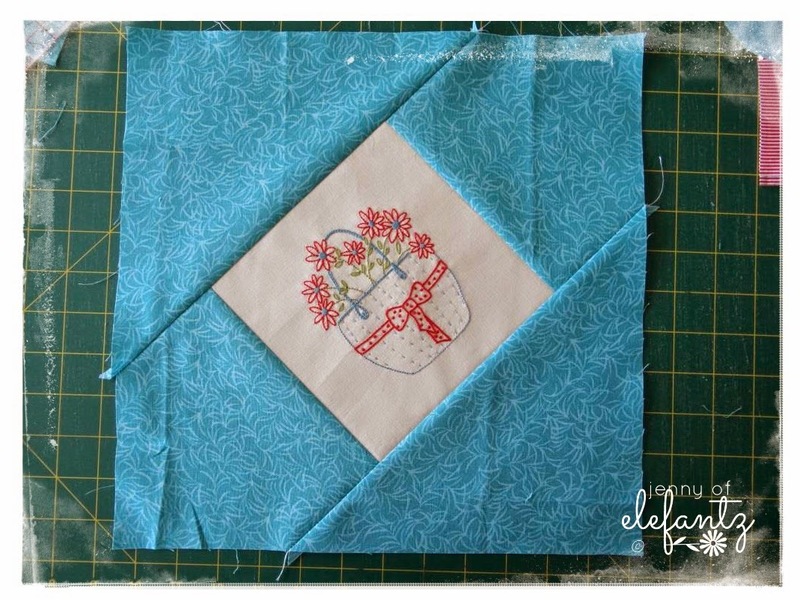 Pull until it is snug - leave the knot outside the pincushion, don't force it inside. 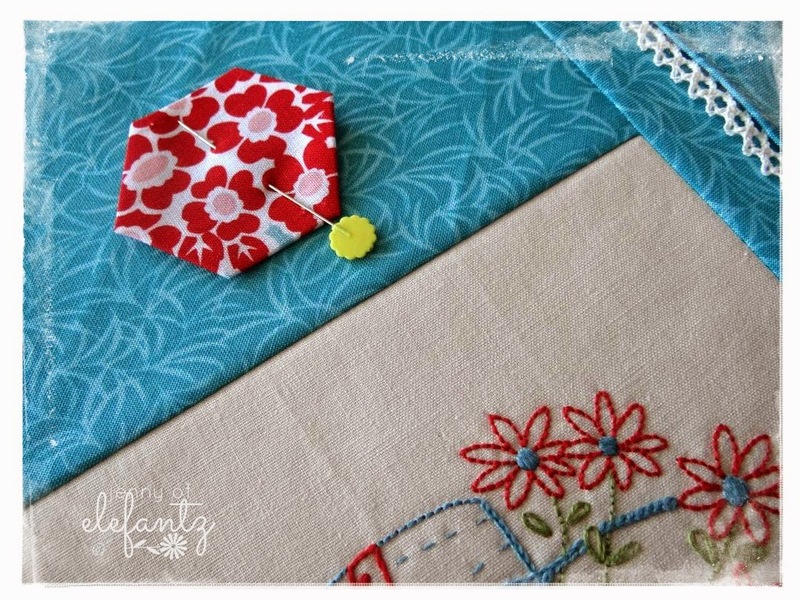 Take your needle and thread over the side of the pincushion and back up through the middle, and keep doing this until you have eight little pillowed sections always sewing your 'pillows' opposite each other as you go because that will assure they are equal distance apart. 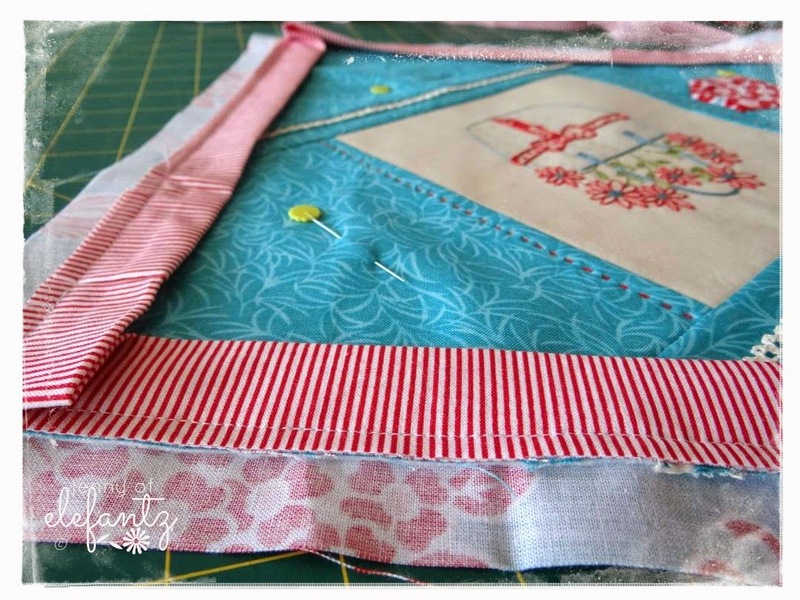 The knotted side of the pincushion will be hidden under the pincushion when it's on your caddy, but trim it to 1/2 inch if it's longer than that. 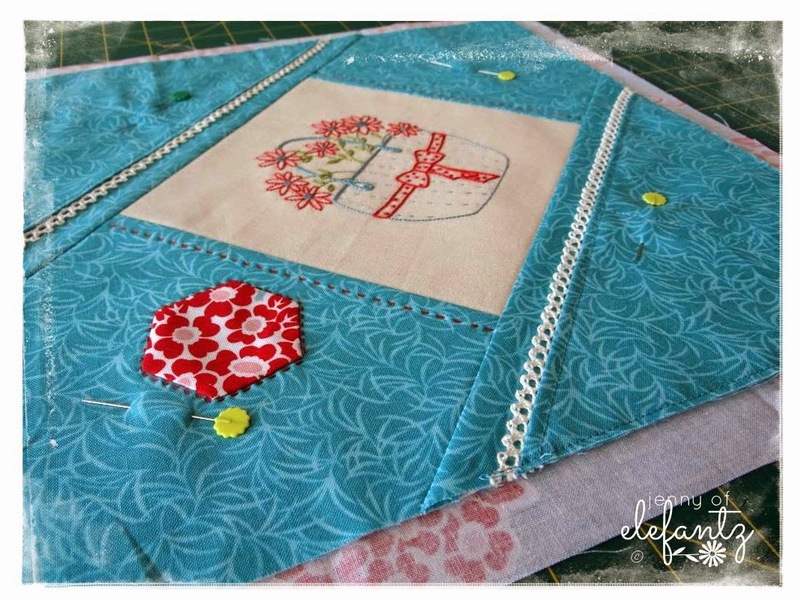 Position your pincushion near the corner edge of the sewing caddy, opposite the hexie. Sew it in place with a button and more Perle #12 thead - but try not to sew right through the caddy. 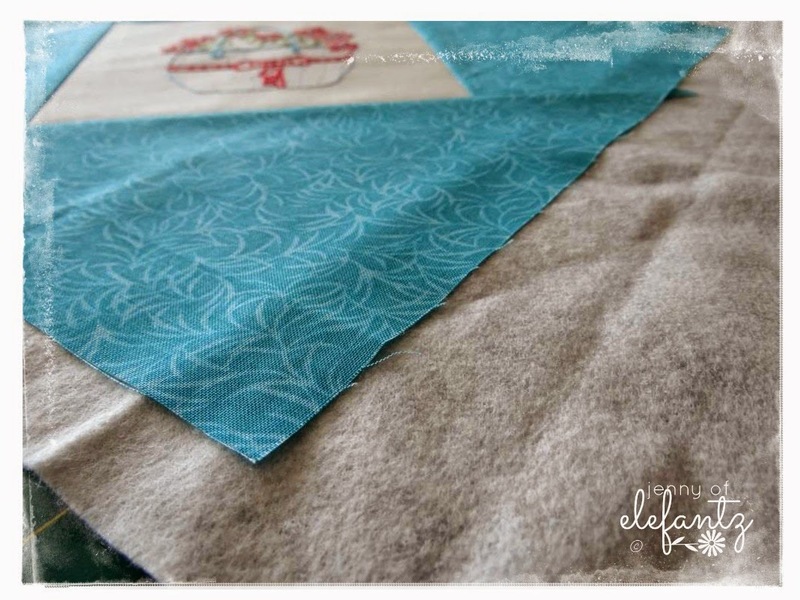 Hide your stitches in the Parlan under the pincushion. 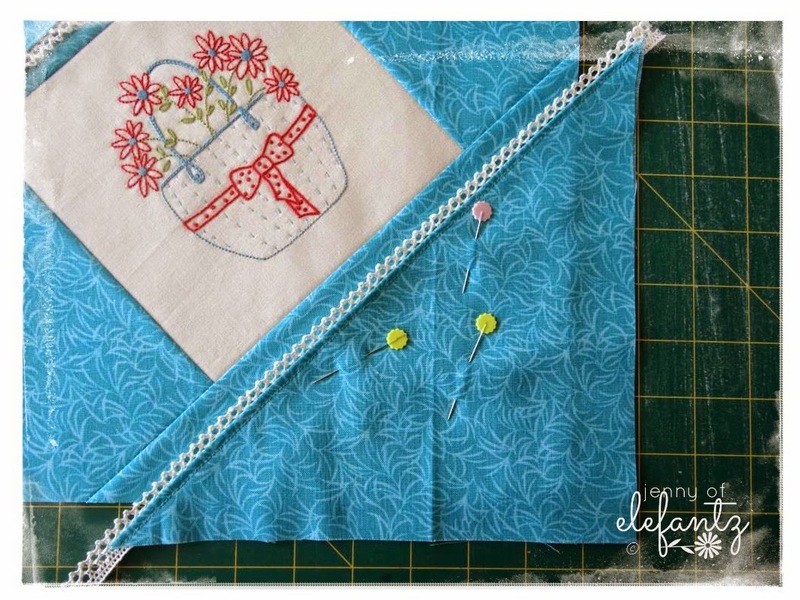 Tie off the thread with a knot just under the base of the pincushion. Espectacular ! me encanta el costurero además de original es muy práctico ,te felicito y gracias por compartir !! Excellent tutorial! 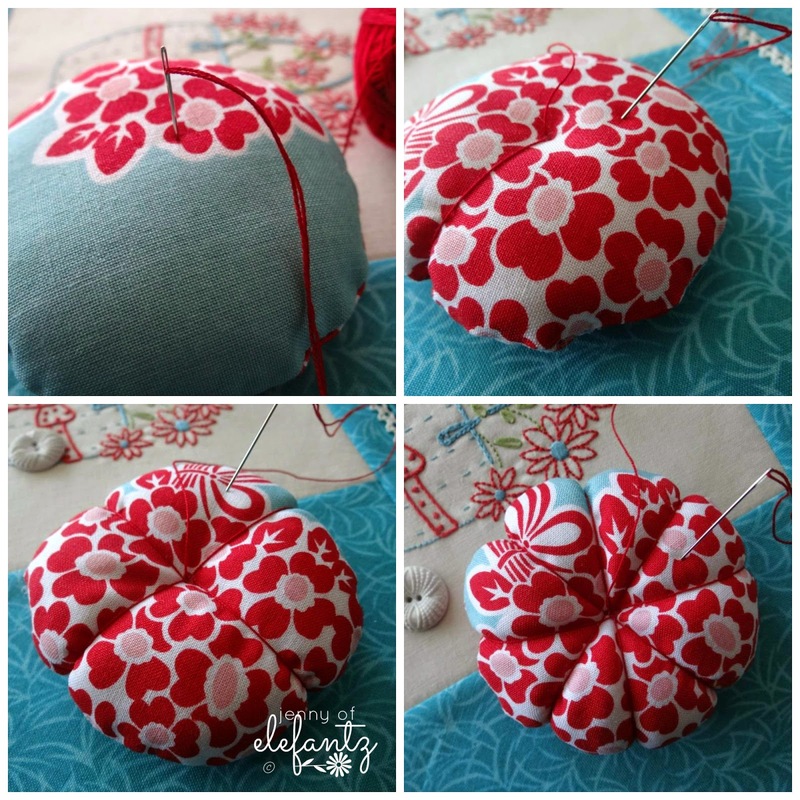 The pin cushion is great as a stand alone pin cushion for gifts. I think your rose tea cup pattern from this month's patterns would be lovely as the stitchery in the middle. My list of want to-do is getting longer. God bless you, so much! Beautiful, Jenny. Thanks fot this tutorial. Kisses from Venezuela! Yet another gorgeous thing to add to my to do list! ohhh my, you broke that down wonderfully simply even i can understand & i'm like others here, my 'to-do list' is getting awfully long! & that's after i've finished all my knitting projects too! Precioso, me encanta, Los colores son espectaculares y el trabajo impecable. Un beso y gracias por ese tutorial. Wonderful tutorial Jenny. Thank you for sharing. A wonderful gift, and so easy to make, the way you describe it. Thank you, Jenny. This is such a great tutorial Jenny. It is exactly what every lady who does handwork needs....and it is absolutely beautiful to boot! Thank you so much. It is such a pretty design. 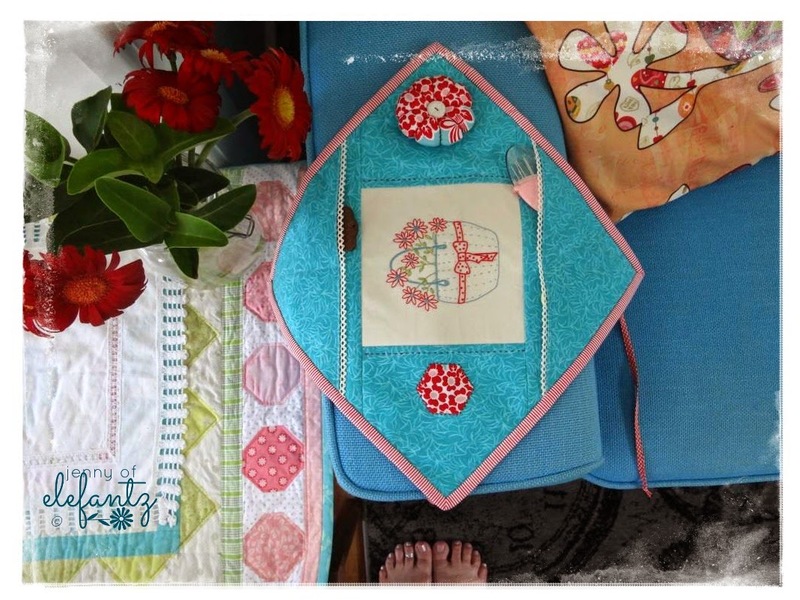 This project is beautiful Jenny with the added plus of one of your superb tutorials. I know I will make this, and soon, with one minor change. You see, each week I meet with 'the girls' at a cafe where we spend 3 - 4 hours chatting. I like to take along a project so that I am being useful as well as enjoying the company. The change I will make is to back the caddy with cotton laminate...this way I can lay it on the table to have a clean work surface for my project and the back will be wipe-clean if I missed seeing a spill on the table before I put the caddy down. You see...an absolutely PERFECT caddy for that situation! Thanks Jenny. I may make this for a friend, for Christmas. Oh sweet Jenny, this is lovely! I haven't responded before as we are on the road to go to Jim's mother's memorial service. I always get sick staying in hotel rooms. They are a haven of germs and my immune system is poor in the best of circumstances. I can't wait to make up this little gem. It would make wonderful presents also. Thank you so much for sharing with us. That's brilliant! Love it. Thank you. Great to take on your travels instead of just a plastic bag! Think I'll practise with the pin cushion first. I've finished 2 so far. 6 more to go. Thanks for the pattern.